Neighbors See Removal of Mass Murder Victims. At 6:20 yesterday morning, William Morey, of 311 20th Street, Brooklyn, yelled for help. 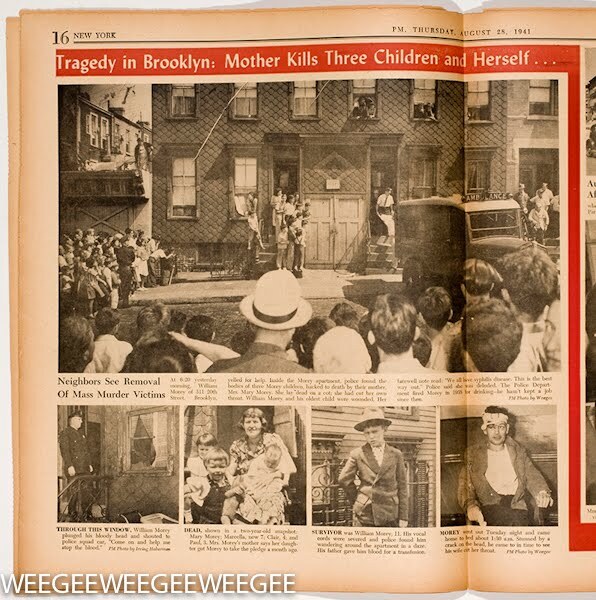 Inside the Morey apartment, police found the bodies of three Morey children, hacked to death by their mother, Mrs. Mary Morey. She lay dead on a cot; she had cut her own throat. William Morey, and his oldest child were wounded. Her farewell note read: “We all have syphilis disease. This is the best wayout.” Police said she was deluded. The police department fired Morey in 1938 for drinking, he hasn’t kept a job since then. Morey went out Tuesday evening and came home to… about 1:30 a.m. Stuned by a crack on the head, he came to in time to see his wife cut her throat. The first-floor flat at 311 Twentieth street, Brooklyn, New York, shaken at frequent intervals by screams, wails, curses and crashing furniture was silent for the first time since the Moreys moved in. Mrs. William Morey (34), and three children, Marcella (7), Claire (4), and Paul (3), had been stabbed to death shortly after dawn. A fourth child, William, Jr. (11), was in the Methodist Hospital, Brooklyn, suffering from lacerations of the throat and severe head injuries. His father. William Morey, sen., a former patrolman dismissed five years ago for drunkenness, had been released from the hospital and was being questioned at the Fifth Avenue police station. There were slight lacerations on his forehead and right hand. The police and the office of the King’s County District Attorney closed the case quickly. They said it was a plain case of suicide and that Mrs. Morey killed the children and herself with an axe and a kitchen knife. In support of this theory, the “Herald, Tribune” states, Assistant District Attorney Edward A. Heffernan said a bloodstained note found in the flat in- dicated that Mrs. Morey was obsessed by the fear that she and her children were afflicted by an infectious disease. The note said in part: “This is the best way out. Don’t touch anything. 1 am suffering from some disease. There was no signature, but Mr. Heffernan believed the note was written by Mrs. Morey. The Moreys had been living in hopeless poverty. Expelled from his 3000 dollar-a-year patrolman’s job, Morey drifted from one occupation to another. The family moved to a poorer neighbourhood, and two years ago they took a flat at 311 Twentieth-street, a three storied frame house covered with faded asbestos shingles. A week before the tragedy. Mrs. Morey took two of her children to a hospital for a blood test. She returned to the hospital for the results, and, in accord with the general practice, was told to have her family physician call for the answer. Apparently this terrified her further. Police found that her fears were baseless and that she apparently was suffering from nothing more than a delusion.